Help : Select a Period (current period if empty) or enter a Account Date Range. 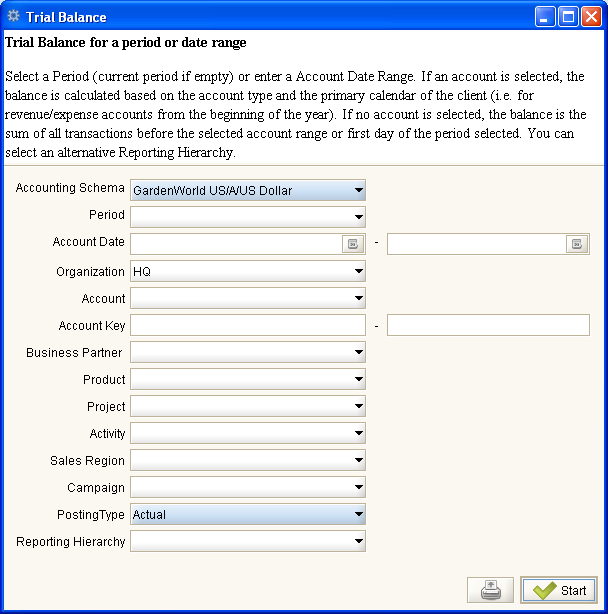 If an account is selected, the balance is calculated based on the account type and the primary calendar of the client (i.e. for revenue/expense accounts from the beginning of the year). If no account is selected, the balance is the sum of all transactions before the selected account range or first day of the period selected. You can select an alternative Reporting Hierarchy. Reporting Hierarchy Optional Reporting Hierarchy - If not selected the default hierarchy trees are used. Reporting Hierarchy allows you to select different Hierarchies/Trees for the report. Accounting Segments like Organization, Account, Product may have several hierarchies to accomodate different views on the business. This page was last modified on 14 December 2006, at 13:00.